Before I get started with this review, I would first like to explain to our readers that I don’t have much fightstick experience. I used to play fighters in the arcades back in the day, but that was roughly some 6-7 years ago, and I never owned one of my own until now. So I can’t say that I can offer you experienced fightstick information, so this review will deal solely with Qanba Q1 fighstick. Accurate comparisons to other fightsticks can’t and won’t be made here. Also, I would like to make note that I’ve waited to use this fightstick for well over a month in order to do this review so that I can give some kind of impression on it’s build quality and longevity. With all that being said, let’s get into the review. The very first thing I noticed about this stick was how stylish it looked. The box sports a nice matte finish on the front, sides, and bottom, with the top sporting really cool Chinese symbols under the plastic gloss faceplate. I have to admit – I kinda felt like a badass when I first plugged the stick in and gave it a go. As far as the look of the fightstick, I have no complaints whatsoever, and it already looks so awesome by default that I personally have no reason to alter it with some kind of custom faceplate image. Speaking of plugging the stick in, that’s literally all you have to do in order to get this thing up and running. No CD or downloadable software is required; the stick comes with it’s firmware on-deck and automatically installs/syncs itself with with the PC or PS3 you plug it in to. This process takes around 5 seconds on the PS3, and about 20 on a PC. There’s also a nice compartment in the side of the fightstick that you can store the USB cord in that also features a hole so that the cord can run out of the box with the compartment closed. It’s all pretty nifty and convenient. Moving on to the actual feel of the stick and buttons, the stick itself strikes a perfect balance between tight and loose. It’s tight enough to give a satisfactory resistance-like feeling, but still loose enough to where you can move the stick freely. 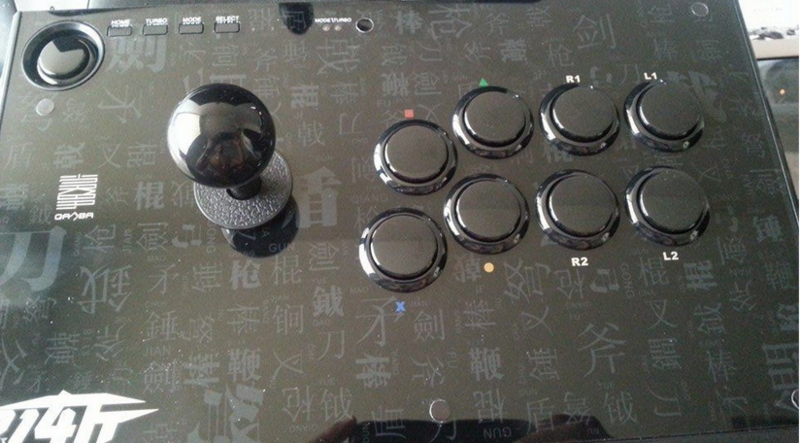 The stick also features 8 directional notches to help with input accuracy (which I’m sure just about every stick has). The buttons on the other hand, are kind of a different story. While I wouldn’t say they feel cheap, they are a tad bit “figdity” and “clickity” so-to-speak. If you have a keyboard that has keys that are somewhat loud when pressed and released, that’s essentially what they feel like. From what I remember back in arcades, the buttons there went down smoothly and fluidly when pressed – these don’t really do that. But as I said in the beginning of this review, I don’t have any recent fightstick experience, so what I described for the buttons may be completely common and may not bother a lot of you reading this. At the top, the fightstick features Home, Turbo, Mode, and Select buttons. What I would say is the most interesting feature about this stick though is the fact that it came with desk clamps. Two clamps pop into the bottom and back-end of the box, with the other side of the clamps latching on the desk. The clamps are secured to the desk by 2 big hard-plastic screws (so you can adjust the tightness) on each side. And naturally, there is a lock mechanism that allows you to connect and disconnect the box from the clamps. The desk-clamp feature I would have to say is my favorite aspect of the Qanba Q1 fightstick, as it allows you to play with your arms and wrists relaxed while offering you a stable, level surface. I found this much more convenient than setting my box on my lap, as I am constantly figditing while playing fighting games. For my first fightstick, I must say that I’m pretty happy with it. All-in-all, the stick has some small issues, but they’re nothing that deters me away from enjoying using it. 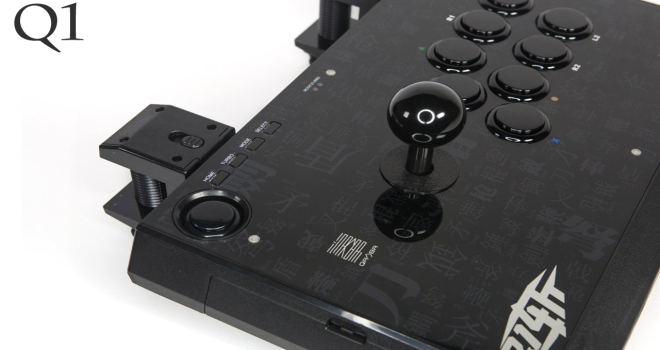 The Qanba Q1 Fightstick runs you an affordable $70 and is compatible with PC and PS3. I would recommend it to any fightstick newbie. so it can be used on ps3,wii,and pc?